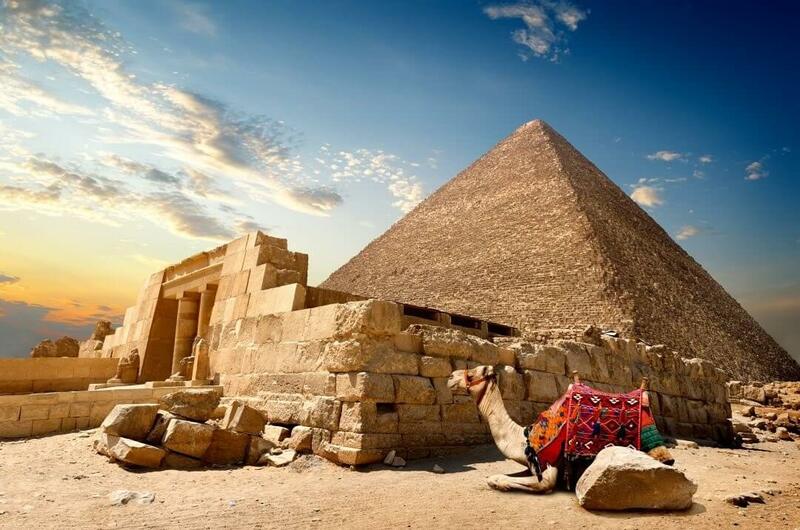 The Great Pyramids of Giza – the most iconic and appealing man-made architectural greatness in the world! The only wonder of the Ancient world that is still standing until today. Ever wondered what makes these pyramids so great? It is one of the tallest structures made by human hands in the world for over 3,000 years in modern Cairo, Egypt. Believed to have been built over a twenty-year period during the reign of the king Khufu (2589-2566 BCE, also known as Cheops) of the 4th Dynasty a defining symbol of Egypt standing the last of the ancient world. 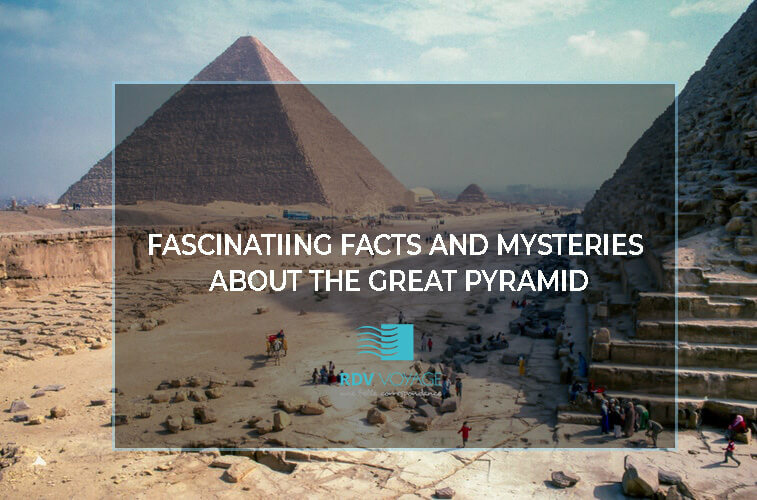 The pyramid rises to a height of 479 feet (146 meters) with a base of 754 feet (230 meters) and is comprised of over two million blocks of stone. 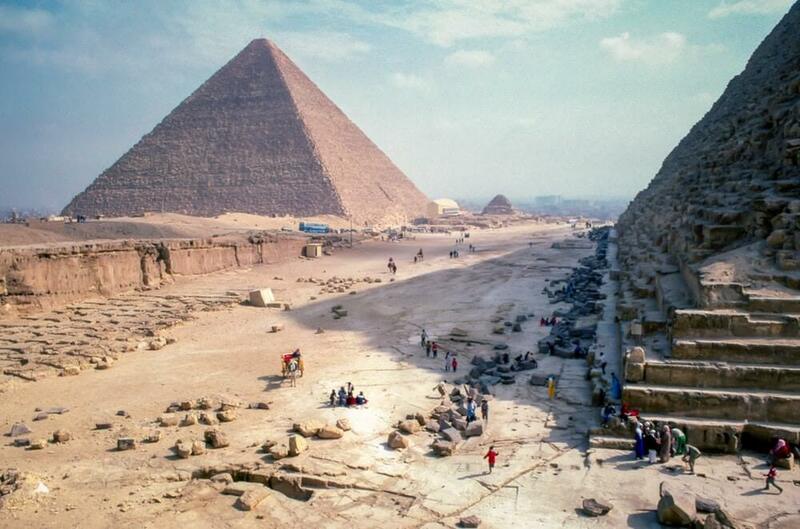 Fortunately, Giza survived to be regarded as a significant site and today’s tourists can experience this unique sight whose structure cannot be replicated today. 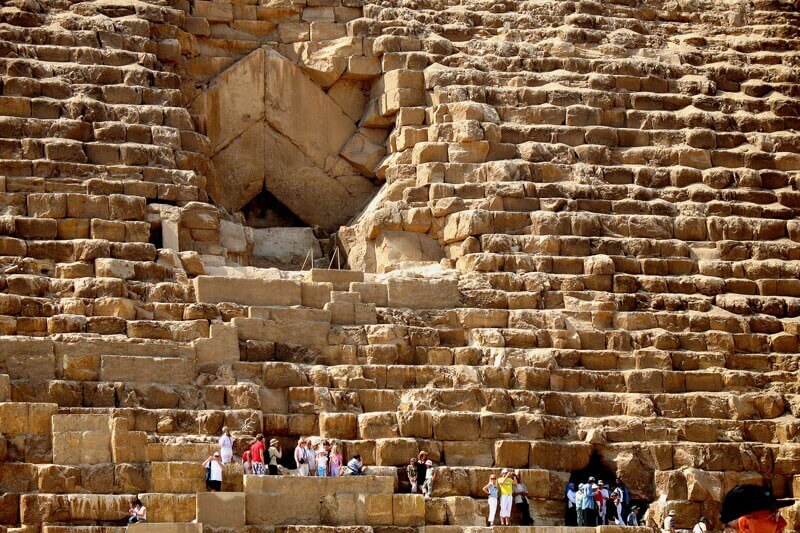 It is estimated that this pyramid used 2.3 million stone blocks and these limestone blocks were carved out by hand! Imagine how the builders back in 2589 BC could have transported these heavy blocks to this valley from about 160 kilometers away. It is a mystery that remains unsolved. An interesting fact is that the temperature inside the Great Pyramid remains constant at 68 degrees F (20C) – the same as earth’s internal temperature. Once you get in, the pyramid passage (3.1 high, 3.4 feet wide) descends about 354 feet into the bedrock, levels off, and continues another 29 feet to an incomplete, underground chamber. The Great Pyramid contains the three burial chambers to house Khufu and the litany of good and treasure he would take with him in the afterlife. The east/west parallel passes over the most land and the north/south meridian that crosses the most land intersect in two places on the earth, one in the ocean and the Great Pyramid (amazingly) it’s at the center of the land mass of the earth. Have you ever wondered how the Pyramid of Giza endured thousands of years without any substantial significant damage? The Egyptians were very thorough and precise with their pyramids. They too, built several pyramids before they could figure out how to make something so strong and long lasting! Their practice was perfected when they built the great pyramid of Giza. Science focus tells us that the stone like granite material plus the tight construct joints of the blocks (making sure no water sips in) made this structure last through thousands of years. However, the question remains! Why can’t today’s materials and technology make something as strong and long lasting as the great pyramid? You heard it right! The purpose of building this great structure was for it being a tomb site but there are no mummies inside! We repeat, there are no mummies! So, what were these shafts intended for? No one knows (yet)! Maybe it’s for ventilation but others also say it’s a passageway for the spirit of the deceased king to immortality. It is still a puzzle how the workers were able to build this structure with extreme precision that even today’s technology cannot replicate. Even up to this day and age we are still discovering new things about this great structure. Recently, a void was discovered in the middle of the pyramid – the size of a plane! The purpose of this void is still unknown. Many more discoveries with regards to this pyramid is still a big question making it one of the most mysterious places in the world!